Mother’s Day comes again. For many this day simply connotes a celebration – a precious card from the kiddos, a chaotic meal at an over-crowded restaurant, and tight squeezes from your little cuties (and maybe not so tight from those rebellious teenagers as you try to remember those good ol’ days and look to the coming better ones with faith!). For some of us, we grieve our miscarriages and wonder if we can ever get pregnant again? For some of us, we remember the child we buried. We hold onto the memories and wish for just one more day. For some of us, we hold our adopted children and mourn their early trauma, yet feel intensely grateful and connected to our child’s birth mom though we may never meet. For some of us, we grieve the life within us that we intentionally ended purposefully. We fight our shame and seek to remember that Jesus forgives. For some of us, we can see the number of children who live in our house, but we can also count the ones who only lived a little while inside our tummies. I am in the “some of us” category. I miscarried one child (She would be 7 now). I adopted one child (now 2.5). I birthed two children (now 8 and 6). So on Mother’s Day, I laugh and tickle ribs and read cards. I will wrap my arms around my children, breathe their scent, and delight in their presence. But as I look into the eyes of my adopted daughter, my heart imagines the story of her birth mom. I feel the part of my daughter’s story that deals with loss. I ache for my daughter and her biological mom. I feel connected to them through our shared journeys of loss. I lost a child in pregnancy. The pain of losing a child (though I never met her) was piercing. I read a blog once of someone who said that as soon as her baby emerged from the womb, she became a mother. No!! I am a mother of four – yet only three live on earth. It doesn’t require birth to become a mother; it requires conception. Even if you have miscarried, and even if you still find your arms empty, you ARE a mother. Even if you have one child in your arms, if you miscarried another, you have TWO children! 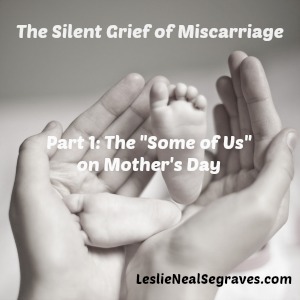 Mother’s Day is difficult for those of us who have miscarried because we are the mother of a child no longer here, a child we’ve never met and yet long for deeply. Just typing that sentence brings tears to my eyes. For those of you struggling on Mother’s Day, I want to leave you with three ideas that might help you make it through Mother’s Day with a little more hope. I certainly do not have all the answers, but I have learned a few things that have helped me on my own journey. Extend grace to yourself for where you find yourself in your grief. After my miscarriage (it took place in December 2008 – I’ll share more in a later post), at various unexplainable times, I found and find myself sometimes experiencing intense longing for my daughter. In the first six months after my miscarriage I often thought, “When will I work my way through this grief?” I remember the day I came to a startling realization. My grief would never fully dissolve. My heart now contains a deep scar. Though I might cope with the loss differently 2 years later than the week of, I will always carry this scar. I finally realized that this is my “new normal.” Now, when I suddenly experience intense emotions for Baby Joy, I just move with it. Heaven is the place of no more tears – not earth. Take time to remember your child. Sometimes in our grief, we want to keep ourselves busy so we won’t notice the ache in our hearts as much. I have found that it helps me to get up earlier on Mother’s Day and have some time by myself thinking about Joy. I sometimes take time to write her a letter in a journal I keep for her. We light a candle for Phoebe’s birth mom and another candle we light for Joy. In later posts, I will share other ways we remember Joy as a family (there are several!). Help another mom in need. I believe some of my healing has come from being available to help others. In honor of the one I lost, I try to encourage another mom in need. For example, I might take a new baby blanket to our local pregnancy crisis center. At times I attach a small note to the receiving mother who has chosen life (rather than abortion) for her child. I encourage her and tell her that I bought the blanket in honor of the child I lost through miscarriage. This act enables me to connect a bit to another mother in her own journey as she fights for life for her unborn child (often at great personal sacrifice). I feel like my little one and I are partnering to bring hope to another struggling mom. On Mother’s Day, those of us in the “some of us” category, may move through our Sunday with a smile gracing our faces, but we may silently struggle. I, for one, want to see the silent struggle shift. I want those who silently grieve miscarriages find an open space to let their children be known and celebrated and remembered – even though no one sees them. And I want those parents to find comfort, encouragement and hope that comes from Christ. During the next five weeks, I will write about my personal journey into grief through miscarriage, my determination to honor my daughter’s short life, and my unrelenting belief that one day I will see my child, hold her, and know her deeply. Wow, I certainly do not have all the answers, but I do know that miscarriage hurts. I also know God can take the stinking, broken, miserable, painful things in life and literally change eternity through them. It is my hope that through these blogs over the next few weeks, others who have experienced miscarriages or those walking beside those who have, will find a little encouragement that helps them navigate the confusing and often lonely journey of grieving the child no one has ever met. Join the Conversation: I know this topic is vulnerable. Obviously it has taken me 7 seven years before writing more deeply on the topic. But if you’d like us all to remember your little one by acknowledging that you also have experienced this type of journey, we’d be honored to do just that. To all my sisters out there, I pray we will be the strongest voices out there for the voiceless. I will leave the first comment to get us started. I miscarried a daughter named Joy at five weeks. Though tiny, she has impacted my life in HUGE ways.